I received a call from Skye of all places from Brum's new owner! I told the new owner all his history - he said the car is still running beautifully! The end of Brum - for me at least! I couldn't sell him to anyone, despite a low selling price and the fact that the car is perfect!! So he's being traded in on the 8th of November for my new MINI Cooper. The car has been fantastic and will be missed. Reliable, fast and comfortable. Difficult to live with sometimes though with misted up windows, bad vision through the plastic rear screen, heavy non-assisted steering and the lack of ABS is a major problem and the reason I crashed it earlier this year. Brum for sale!!! I've decided to try and buy a new MINI Cooper instead - It will be more suitable for motorway duties for work (quieter and more economical) and, I think, more trendy and more fun. I've only managed to get the top down a handful of times this year - it just doesn't seem worth it. shock! - something's actually gone wrong with my car! Its just about the only bit that isn't a Mazda part though - my lovely Air Horns. I've had to remove them for now and its back to making a horrible Nissan Micra type BEEP instead of my lovely loud blaring horns! Nothings gone wrong! The car has been running perfectly for months and months. I've driven it to London and back a couple of times and have also been zooming all over the highlands in it but it continues to run perfectly, even as it is approaching its service. I bought Brum a superb Sony CD-player as a thank you for running perfectly all summer! Running perfectly, nothing to report, even with a 2 day 1000 mile motorway trip. Running perfectly as usual, nothing to report. 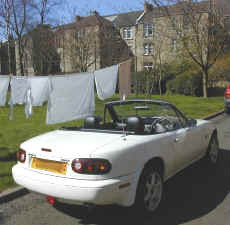 We've had fantastic weather in Scotland for 2 weeks solid and I've had the top down every chance I've got. I joined the Mini Clan for the day and drove to Dunoon via Arrochar. 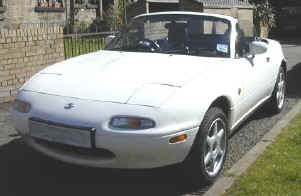 The MX-5 was just perfect, 170 miles of pure fun and only some sunburn! 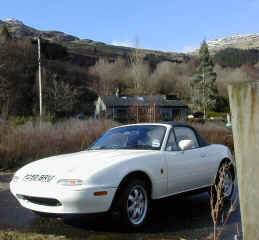 Had an amazing drive to the highlands and back in one day - the car running beautifully and really impressing. 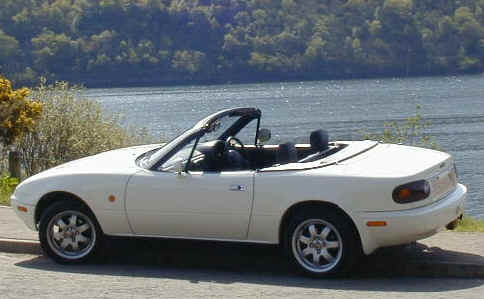 Glorious weather so the tops been down almost constantly! Spent nearly a full day T-cutting, then polishing the car - the first attention its had (apart from the local carwash) since about October. Looks A LOT better but a few nicks and scratches to attend to after a hard winter on the city street. Jammed my thumb in the bootlid - argh!! 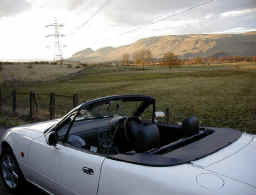 Had a fantastic drive to Loch Lomond with the top down all day - attracting lots of attention! Brum is alive and well after his accident last month. The bodyshop (C.H. Bull, Bridge of Weir) got everything perfect after some adjustments and it drives as new now. Its got a new set of alloy wheels on it, and I've finally installed the cup-holders that I ordered ages ago (they replaced the ashtray). Brum's been MOT'd for another year. A broken rear coil spring was discovered - I was surprised I hadn't noticed, and I didn't feel anything different when I got it back! I lost confidence in the brakes (non ABS) after the crash so played around with them a bit. Someone on the MX5 group told me to brake at 75% until the nose dips, then to brake hard to avoid premature brake lock-up. It seems to work! Took Brum to the Skid Pan oval at Crail - fantastic fun but the car got VERY dirty! I learnt a lot about rear-drive handling. 8th Feb: I CRASHED BRUM! :-( I was out visiting Arno and Angus, and took a small back road (B777 to Beith). For some reason I didn't see a corner properly and didn't brake in time - Brum skidded and went headfirst into a wall. The suspension looks knackered and there's bodywork damage to the front. I'd only gone out for a drive in him because I felt I hadn't driven him for a while - I was really enjoying it up until the crunch! The driver's side front wheel was bent over and also not round any more (it hit the kerb side on) so the car had to be half-dragged half-driven onto the recover vehicle. The locks are a bit sticky, a funny thing happens to the hood sometimes (twice in one year) where I have to fold it down and back up again to close a gap around the passenger's window - any ideas? The boot's needing a good slam now too. I've been looking at new MOMO steering wheel's and CD-players - sometime soon I hope! 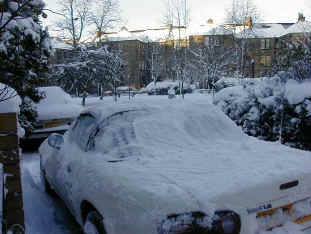 29th - Dug Mazda out of its snowdrift. VERY difficult to open either door - the glass had frozen to the rubber seals! Very little traction from the rear wheels although it steers OK in the snow. 28th/29th - HEAVY Snow fell here - 15 inches overnight. The Mazda is VERY tail happy even on flat roads, the slightest incline can cause it to completely lose traction. The Mini was MUCH better in the snow (fwd, heavy front, skinny tyres). Brum is filthy but I don't see much point in cleaning him as he only gets dirty again! Locks are a wee bit sticky sometimes and boot sometimes needs a couple of slams before it shuts but that's all there is to report! Leant Brum to my brother in law John for 3 weeks while I holidayed in the United States. Think he enjoyed it a lot more than his usual transport - a 1.1 litre Metro and a 1.6 litre Volvo! Unortunately he left the lights on (no warning buzzer!) and drained the battery which meant that the engine management seemed to forget all its "learning" and was a bit spluttery but after a good thrashing in the hills it soon reverted to its normal smooth self! Very slippery on the late Autumn roads here with the leaves, salt etc. When I'm on my own the rear end is very willing to let go! Love the way the hood inflates when you put the fan on full - hadn't noticed this until recently! It deflates when you turn the fan off - I guess it means my seals are all OK! Brum has just returned from his 36 month service (at 24000 miles). It didn't feel like it needed it and the oil was still semi-transparent. New brake pads & wipers were all that was required but the service still cost a hefty £350! Carried out perfectly though by Queensborough Mazda - including oiling the locks, washing & vacuuming the car and doing a full bodywork check (all ok). The new MX-5 Isola in the showroom is gorgeous - red with a red hardtop for 15 grand. Its quite simple - there's nothing else to report! The car just keeps running perfectly - its amazing! Thousands and thousands of miles without a hiccup. 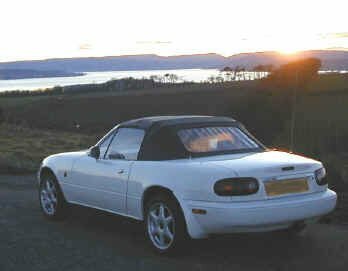 Wish I could afford a hardtop though - Autumn is suddenly here and although the car is still nice & snug with the soft top, its not going to be down now until next year I'd guess and a glass rear window would be much more useful as it has a heated screen too. Spent nearly a whole day T-cutting and polishing the car. Its still not ultimately as shiny as my Mini used to be, but it looks great anyway. For various reasons I had to use Brum for a few work-related trips to the South of England meaning that he suddenly clocked up a big mileage. He's handled this comfortably. Excellent motorway car, although a higher 5th gear would be nice as he sits at about 4250 rpm when cruising. Suffered a tyre blow-out at 80mph on the motorway at one point! Very scary, as was driving on the teeny space-saver until I could find a replacement 195/50 VR15 tyre. Got 110+ mph out of him on an uphill stretch of road - he did this easily, in 5th gear, without any fuss and in a few seconds from 80mph. It didn't seem any less smooth than at 80mph cruise. Got 320 miles out of a tank of mostly high-speed motorway miles. Still unsure about how big the tank is or how accurate the gauge is. He's now due for a thorough valet and I'm going to renovate his paintwork as his lustre has been faded a bit by all the miles. Found the rattle! A white nut was rolling about under the rear parcel shelf...wonder what it's meant to do? I've saved it just in case. Discovered that I can safely jet-wash it as long as I don't aim the jet at the seals. It leaks less than my old Mini. Paint doesn't seem incredibly shiny - even when washed/polished. Maybe his previous owner neglected him. Tonneau cover almost impossible to fit properly! Had a tyre blowout at 80mph on the motorway - car behaved perfectly and just kind of sat down on the road and shook! Took it for a trip to the North West of Scotland for a sunny long weekend by the beach and fell in love with the car even more! Its just brilliant. What more can I say? See photos in the Brum Gallery. Feels very fast - even when just trying to cruise - the bonnet lifts and it just takes off when you put your foot down even a wee bit. Popup headlights quite embarrassing - when you flash your lights, everyone thinks you're showing off, also compared to the Mini's 6x60w lights, they're pretty pathetic output. fantastic speakers in front doors - much better than I'd hoped - surely cant be standard!? Gears are gorgeous - you can change using only your wrist - compared to the Mini's "rowing" acting its just amazing! Nowhere to put anything compared to Mini! No buttons/toys even compared to Mini! Lots of attention - more than I expected...? Fairly difficult to park - where are the wheels? !